Your Building’s Carpet Might Not Look Dirty, But You Need It Deep-Cleaned! The cleanliness of the carpets in your business has the ability to create a positive or negative first impression. The professionals at ServiceMaster Twin Cities provide deep cleaning carpet services for commercial buildings and offices to give you healthier guests and longer-lasting carpets. In Arkansas, ServiceMaster Twin Cities has provided superior commercial janitorial services for more than 25 years, and we offer deep cleaning carpet services for businesses of all sizes to help keep it and your business space look great for a long time. 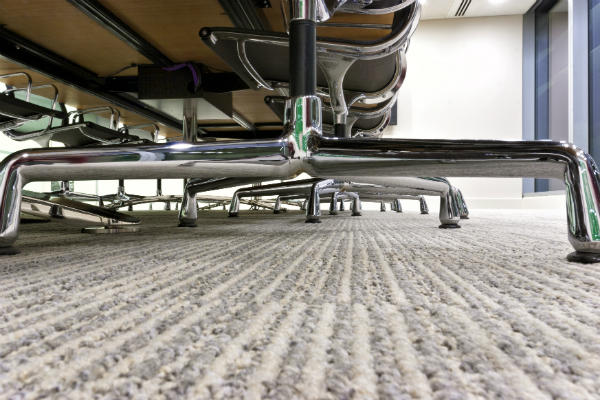 Often, the carpet in a commercial building may not seem dirty. Colors and carpeting patterns designed to act as camouflage effectively hide dirt, dust, grime, and even stains. Over time, layers or embedded dirt and particles can cause damage to the carpet fibers. Damaged fibers lead to snags and thin spots that make the carpet in your building look worn and even shabby. Even if the carpet does not look soiled, it still is essential to have it professionally cleaned at least once every six months. According to the Asthma and Allergy Foundation of America (AAFA), 30-percent of all adults are affected by allergies, and that number increases to 40-percent for children. Dust, mold, and dirt tracked in from the outdoors build up regularly in carpets, reports How Stuff Works. Allowing these allergens to collect in your carpets can affect the health of employees, potentially leading to lost time. Fortunately, professional carpet cleaners like ServiceMaster can remove the dirt, allergens, and other pollutants from your building’s carpets safely and effectively. Regular cleaning may also help extend the life of the carpet, keeping its fibers from crushing, matting together, and fraying which cause a worn look that never looks professional for a business. Hiring a professional cleaner for the first time is not intimidating; we are here to give you the cleanest result possible. A professional carpet cleaner provides peace of mind that the job will be done correctly, the first time. “The amount of traffic that the surface of the flooring is subjected to on a regular basis, as well as the fiber construction and color are among some of the differing factors that only a professional in the industry will be knowledgeable about,” states the Institute of Inspection Cleaning and Restoration Certification (IICRC). Professional carpet cleaners who are trained in deep cleaning carpets, like the teams at ServiceMaster Twin Cities, know all of the tricks to get that carpet back to the way it should be. To schedule a deep cleaning carpet service, contact ServiceMaster Twin Cities at 877-461-1774 today.